Osprey books are usually researched pretty well and always have great illustrations. 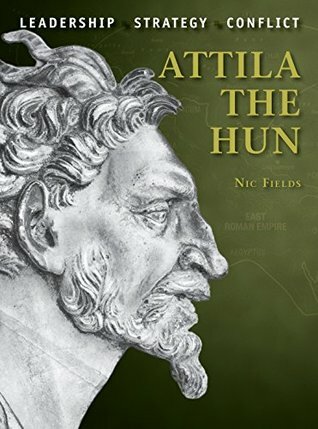 Attila the Hun is no exception. I haven’t read many titles in the Command series — in fact I think the only other one I’ve read is the older one on Alexander the Great. I usually just get the Warrior and Elite series books when I’m working on a wargaming army, and I haven’t really been as involved in wargaming for years. But — full disclosure — I got a copy of this one for free from the publisher in exchange for an honest review. Previously published with a different cover, the 2015 edition is pretty slick looking. Attila is a semi-legendary figure, as we know very little about him apart from what a few Roman writers have recorded about their enemy, and some mythologized impressions of him in the character King Etzel in the Nibelungenlied. What we do know, and much that is presented as reasonable conjecture, makes up the majority of this short book, along with brief looks at some of Attila’s major Roman and Goth adversaries, and short accounts of a few battles. The battles are illustrated with the customary Osprey diagrams. There is practically nothing on the Huns’ equipment, military organization, and orders of battle or army composition — partly due to the limited amount of information we have and partly because the Command series does not focus on these topics, unlike the other Osprey military history series. So if you are interested in knowing more about how the Huns were armed and fought, you need to look for The Hun : scourge of God, AD 375-565 in the Warrior series — also by the author of the present book. This book — being in the Command series — is mainly interested in Attila’s qualities as a strategist, diplomat, and leader. What little we can guess about Attila’s motivations and psychology are explored in some detail, and though he remains shrouded by the legends that have grown around his name, the book does manage to give a coherent picture of the man. The author compares him, somewhat unfavorably, to Genghis Khan, but then Attila did not have the benefit of an organized propaganda campaign like Genghis did. The art in this book is generally good, combining period art, later reconstructions, and a lot of indirectly related things (for example, an image of a 20th century Tibetan archer to suggest how the Huns shot their bows, and armor and other artifacts the Huns might have looted from Goths, Romans, and contemporary steppe nomads). The illustrations commissioned for the book are about average for Osprey’s books — reasonably detailed, well-researched, and explained exhaustively in the text. They don’t have the drama and power of the late Angus MacBride’s work, but I can’t fault this book on that score. The bibliography provided in this book is also very detailed, and we see that the author used a range of sources, from the original Latin and Greek historians, scholarly articles, and more “popular” magazines. There is even an entry for John P. Greer’s Armies and enemies of Ancient China — a very dated work that has a lot of misinformation. I think this reflects more the comprehensiveness of the author’s research than sloppiness though. I didn’t see anything questionable here.